Andrew recently wrote an excellent article for The Holocaust History Project, published here, in which he used the principles of general semantics to expose the fallacies of Holocaust deniers. Below I explore five more fallacies that I have encountered in 'revisionist' literature and in on-line debates with deniers on RODOH. While absence of evidence is not absolute evidence of absence, it is generally evidence of a high probability of absence. With reference to the Reinhardt camps, we do, of course, have a convergence of evidence from transport records, contemporary documents, the Korherr Report, the Hoefle Telegram, eyewitnesses, perpetrators and site investigations which shows, beyond reasonable doubt, that over a million Jews were murdered at the camps. Revisionists have had over sixty years in which to find records of transports taking Jews from the camps to the USSR, or records of resettlement, or even eyewitnesses of such resettlement, but have been unable to uncover any such evidence. They have been unable to explain why no defendants at postwar trials, including those such as Eichmann who had direct responsibility for 'evacuation' transports, ever used the 'transit camp' gambit in their defence, despite the fact that this would surely have been the most obvious defence available, had it been true. Moreover, they ignore the fact that the Soviets signed repatriation agreements with Poland in September 1944 and July 1945 but the total number of Polish Jews who returned under those agreements was only 230,700 (source: Yosef's Litvak's essay in Polonsky and Davies, Jews in Eastern Poland and the U.S.S.R., 1939-46, p.235). Consequently, the 'absence of evidence' gambit is a fallacy because there are powerful reasons why evidence of resettlement should be present. 2. 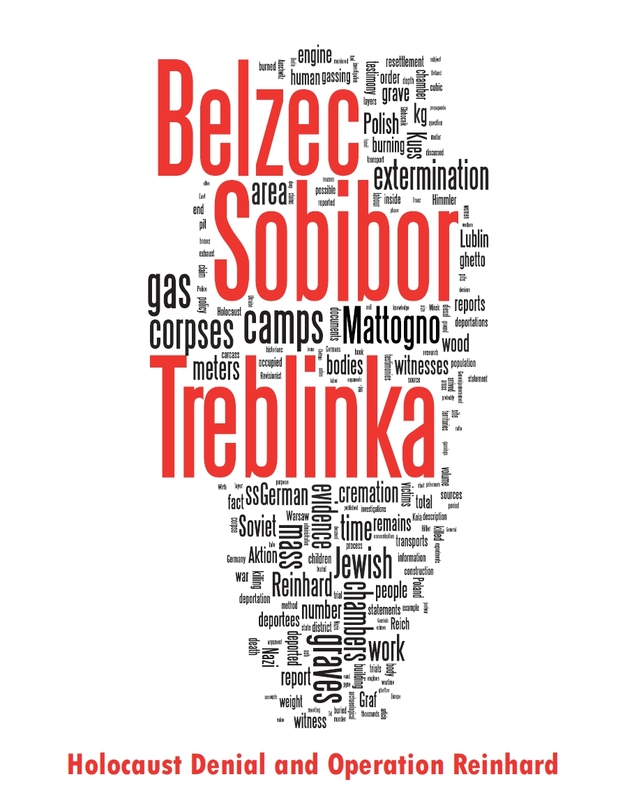 'Evidence of gassing at camps such as Treblinka and Auschwitz does not meet an absolute standard of scientific proof'. This is the burden of proof fallacy. It is fallacious to demand that historians meet a higher burden of proof than would be required in a court of law. It is also fallacious to ignore the fact that the Nazis systematically destroyed evidence of their crimes so historians must reconstruct the Holocaust from fragmentary documentation. In view of the incomplete documentary record, the high degree of convergence in the remaining evidence is conclusive proof of genocide, beyond reasonable doubt. Moreover, even scientific experiments carried out in a laboratory are subject to an uncertainty principle, so the deniers' burden of proof is not even accepted by physical scientists. 3. 'The story keeps changing'. As with the burden of proof fallacy, this claim appeals to an audience that is ignorant of historical method, legal procedure and the sociology of knowledge. There is no historical event which is currently interpreted in exactly the same way that it was in 1945. Demanding that the Holocaust 'story' remains static is thus bone-headed. 4. 'The Soviets lied about Katyn and the Ukrainian famine so they could have fabricated the Holocaust and lied about that too.' This fallacy ignores two obvious facts. Firstly, evidence of Katyn and the famine did reach the west, both at the time and since, and the Russians did eventually admit to Katyn in the post-Glasnost era, so this denier fallacy simply begs the question as to why no evidence of Soviets fabricating the Holocaust has ever come to light. Secondly, the Soviets did not have a monopoly of access to Nazi documents or eyewitnesses. For example, the gas van documents submitted to the IMT (as bundle 501-PS) were discovered by the US 12th Army in Germany, not by the Soviets (see John C. Zimmermann, Holocaust Denial, pages 357-358). 5. 'The allies fabricated propaganda of German atrocities in World War I so obviously did so in World War II as well.' There is no evidence cited to support this claim, and it ignores the fact that many Nazi atrocities were documented by the Nazis themselves. Deniers are falsely equating atrocity stories from WWI that never had supporting evidence with a historical record from WWII that contains an overwhelming convergence of evidence. Let me make a remark on the "burden of proof fallacy." Maybe in the humanities it is different than in mathematics and the natural sciences. So please correct me if necessary. In physics and mathematics, the person who makes a statement A has to prove that A is true. The "burden of proof" lies exclusively on him. He cannot evade this by demanding from another person to prove that non-A is false. That would, afaik, be a case of "burden of proof fallacy." 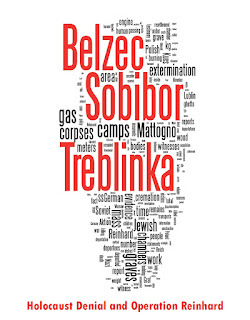 Applied to the case of Treblinka, it is everybody's right in an open society to demand from us that we prove that our statement T: "At Treblinka Jews were gassed," is true. We make the statement, so we have to prove it. We are convinced that we have arguments enough to do this. But we should be careful in dismissing critique of our proofs. It should, on the contrary, make us reconsider our arguments, eliminate lacunae, search for better arguments. Even if the critique comes from a person we do not like or who, we feel, does not like us either, e.g. a HDer, an antisemite, or a Nazi whitewasher. If, however, the HDers demand from us to prove that their statement non-T ("At Treblinka no Jew was gassed") is false, we can rightfully reject this, because they would have to prove their statement, and we can rightfully accuse them of the "burden of proof fallacy.". There is, admittedly, the problem that we have only incomplete information about historical events. So we will never be able in history to give a proof with the same degree of exactness as it is demanded in mathematics. But we should avoid two traps. First, the Heisenberg uncertainty principle is often grossly misunderstood by non-physicists. It makes a statement about the behavior of atomic and sub-atomic particles under certain experimental conditions. To extrapolate it retrospectively into the sphere of macro events, even metaphorically, makes no sense. So let us avoid it in the discussion of Holocaust issues. Second, I absolutely disagree with the statement that we cannot demand from historians more accuracy in proofs than is demanded by a court. Historians are not judges. (Though it is sometimes tempting to slip into their role.) A criminal court has a different agenda, prosecutors have different aims than historians should have. Judges and prosecutors are often - also in democratic societies - bound by political preconditions. Ask any practitioner in the field, and he will tell you that the independence of the judiciary from legislature and executive is an ideal, but that in practice, especially in political cases (and terrorism, war crimes, crimes against humanity, and Holocaust denial are always crimes with a strong political note) there are many interdependencies. And don't let us forget that judges are human beings, that they are not infallible, that sentences not too seldom turned out to have been based on erroneous assumptions. This holds also for democratic countries and, in no case, frees the historian from further investigations. the normal experience is that one encounters a flat negation, statement not-T, which ignores the evidence that is available. It is not up to each and every one of us to walk around with an encyclopedic knowledge of the primary sources and be better than Arad, Rueckerl or Mlynarczyk. That role belongs to you or I, as academic historians, and it is entirely separate from debating denial. It may help debate deniers but it is not the same thing. Statement-T has been proven, and will go on being refined as befits any other event in history. In *formal debating terms* the burden of proof has shifted to the revisionists. This cannot be emphasised enough, since a common debating tactic of deniers is to reverse the burden of proof. It is not only shared by deniers, but by all conspiracy theorists. Just watch the 9/11 Deniers at JREF forum for a day or two and you will see what I mean. - a conspiracy theory used as 'evidence' to back up the assertion not-T, e.g. that all of the witnesses were liars, flatly asserted without proof. Each requires slightly different responses, but at least one of them contains a burden of proof fallacy. Moreover, at least one is couched in the form of an excessive demand for proof that is not humanly possible, especially in internet discussions. This should be borne in mind, because at the end of the day discussions on the internet are marginal. It needs to be stated that since statement-T has already been proven to the satisfaction of historians, courts, society at large, international governments etc, then the burden of proof very much now rests on revisionists not only negate the existing evidence but propose a better explanation of all of the existing evidence. This is because historians and philosophers of history agree that inference to best explanation is the most reliable means of determining fact from fiction in history. Revisionists cannot be absolved of the requirement to provide a better explanation. This boils down to two aspects in the case of Treblinka, or any other camp, namely (a) proof of an alternative fate, (b) proof of the conspiracy/delusion/process necessary to have bamboozled the world for more than sixty years. Since neither are ever forthcoming in a meaningful fashion, revisionist arguments fail, and the residue resembles little more than nitpicking. What is usually the case is that more or less all five of the attack angles I sketched above will be tried in sequence. The end result is a hodgepodge of fallacies that give one nothing more than headaches. As for historians vs courts, I agree; historians are meant to give the best and most detailed, most considered explanations of the evidence they can, and not simply rely on the fiat of a court. Two good examples, now very old, are Reitlinger and Hilberg. Neither relied on the authority of the IMT at Nuremberg to calculate the number of murdered victims of the Final Solution. That is historical practice, and the results were infinitely better in many respects than IMT. The same can be said for Franciszek Piper vis-a-vis the Krakow NTN tribunals in 1947. All of these historians can be improved on, and have been. They are not the final word, nor should that be so. Here is where the confusion arises between the natural sciences and historiography. If one applies strict logic, then any event in history cannot be regarded as "proven" since there is always the chance that more knowledge will become available, and thus the horizon of 'absolute proof' will be ever-receding. The implication is that only a perfectly formulated answer would count as 'proof'. In practice the standard of proof, and the epistemological basis for truth in history, rests on the inference to best explanation principle. This has been advanced by philosophers of science as well, so there are analogies with other sciences, especially biology and palaentology, which are likewise historical sciences and closer to history than is mathematics. The best explanation of the evidence is, as I said, that Treblinka was a death camp, just as the best explanation of the evidence concerning events in Petrograd in Frbruary 1917 is that a revolution broke out there, just as the best explanation of the evidence is that Caesar crossed the Rubicon, and so on. One can demand to know the names of every woman who joined a bread riot in Petrograd but this is ultimately an absurd request. It might be possible to find this out; and let's say a historian did so. That doesn't make the historical account of the February 1917 revolution any more or any less scientific, simply more detailed. The event remains true, and thus, proven. Disproof could only arise if a better explanation is offered. In this sense, history does rather resist the demands of formal logic, something which many philosophers have noted and argued about. I feel that we, in principle, agree on this issue. In my previous comment, after "We are convinced that we have arguments enough to do this," I should have added "So we need not invent the wheel anew - what HDers often demand from us." It would have made my point of view clearer. But let me address another HD fallacy: the "Change of Paradigm fallacy." Referring to Thomas Kuhn's groundbreaking work on "scientific revolutions," HDers demand a change in the Holocaust paradigm from an "exterminationist" to a "revisionist" one. We here have another example of sloppy reading (to say it politely) a text that deals with aspects of natural science. (I previously remembered Heisenberg's uncertainty principle as an example.) When in natural science a "change of paradigm" took place, it always concerned they way of _interpreting_ the hitherto known facts, never denying them. E.g. the great Danish astronomer Tycho de Brahe believed in geocentrism until his death. His precise observations of the movements of the planets, however, were basic for scholars such as Copernicus, Kepler, and Galilei, to prove the heliocentric worldview. The facts didn't change, but their interpretation. The same holds for the Holocaust. It is possible (and IMO also legitimate) to interpret the Holocaust differently from today's mainstream view - its historical context, its roots, for example. But building a new interpretation on the denial of the "hard facts," such as the killing of millions of Jewish individuals in gas chambers, or the - approximate - number of murdered, is not a "change of paradigm," but simply intellectual fraud. Excellent comments, Joachim and Nick. I should have replaced 'court of law' with 'standard historical practice', and then defined the latter as inference to best explanation from the available evidence. I think we can also add Occam's Razor to the inference rule: the inference should require as few prior assumptions as possible. "I feel that we, in principle, agree on this issue. In my previous comment, after "We are convinced that we have arguments enough to do this," I should have added "So we need not invent the wheel anew - what HDers often demand from us." It would have made my point of view clearer." This is a good example of the confusions which can arise when discussing these matters. "But let me address another HD fallacy: the "Change of Paradigm fallacy." Referring to Thomas Kuhn's groundbreaking work on "scientific revolutions," HDers demand a change in the Holocaust paradigm from an "exterminationist" to a "revisionist" one." This is a good example for many reasons. "We here have another example of sloppy reading (to say it politely) a text that deals with aspects of natural science. (I previously remembered Heisenberg's uncertainty principle as an example.) When in natural science a "change of paradigm" took place, it always concerned they way of _interpreting_ the hitherto known facts, never denying them. E.g. the great Danish astronomer Tycho de Brahe believed in geocentrism until his death. His precise observations of the movements of the planets, however, were basic for scholars such as Copernicus, Kepler, and Galilei, to prove the heliocentric worldview. The facts didn't change, but their interpretation. The same holds for the Holocaust. It is possible (and IMO also legitimate) to interpret the Holocaust differently from today's mainstream view - its historical context, its roots, for example. But building a new interpretation on the denial of the "hard facts," such as the killing of millions of Jewish individuals in gas chambers, or the - approximate - number of murdered, is not a "change of paradigm," but simply intellectual fraud." Joachim, you are quite correct here. There is much to discuss concerning the application of Kuhnian paradigm-theory to the social sciences and humanities. The first point is that Kuhn's idea proved wildly popular outside of natural sciences, even within a few short years of publication. Yet it is doubtful whether one can really translate the theory to the humanities/social sciences properly. The second point is Kuhn's theory is quasi-sociological. It focuses on a community of scientists, not on a wider population. Since the number of academic historians and practictioners of related disciplines who have advocated for the "paradigm shift" is precisely *zero*, then clearly the entire discussion is pointless. Thirdly, even if one wished to apply the term paradigm to historiography, then it's too broad to cover just the historiography of one event. One might speak of a Rankean paradigm, but not really of a Holocaust paradigm. But the ultimate reason why the 'paradigm shift' angle is pointless is because there is no genuine attempt at revision with deniers. Yes. Denial is not a paradigm: it is a negation. Deniers are not attempting to replace one theory with another: they are seeking to destroy a historical record and its associated human memory. The rise of functionalism could be viewed as an attempted paradigm shift. However, it also shows the weakness of the paradigm concept, because functionalism never replaced its predecessor, it simply went into competition against it, and most Holocaust scholars now adopt a pick and mix approach rather than preferring one paradigm over the other. No. An interpretative stance is not a paradigm. A paradigm is closer to a methodological approach. One can speak of the Rankean paradigm in history, but not of a paradigm regarding shifting interpretations of specific historical events. Even a 'school' if so labelled (eg Annales school) is not a paradigm. This is why Kuhn's theory should not be applied indiscriminately to the social sciences and humanities. I would argue that functionalism is a methodological approach. An explanation of a historical event always implies a methodology, and indeed an epistemology. This is implicit in our critique of denial: the arguments they use have to be deconstructed in terms of their distortion of 'how we know something is true or false'. "I would argue that functionalism is a methodological approach." Functionalism might be a methodological approach in *sociology* but within the history of the Holocaust, it isn't really even an -ism, just a tail pinned to some donkeys. There is no substantive methodological difference between Mommsen and Breitman. Both are modern historians, end of story.